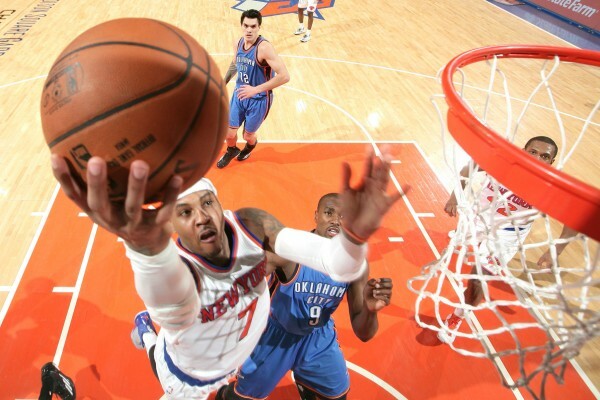 The 2014-2015 version of the New York Knicks will go down in history as one of the worst the franchise ever had, but there are still some positive moments along the way, as Carmelo Anthony led them to a 100-92 win over the Oklahoma City Thunder, playing without Kevin Durant, which means a whole lot of Russell Westbrook. Westbrook didn’t disappoint or surprise: He finished with 40 points while taking 30 field goal attempts, hitting only 13 of them. Anthony wasn’t far behind with 31 points but unlike the Thunder, who surrender completely to the shooting and whims of their star, the Knicks have found some new offensive options through their miserable run of losses which has been halted, changed into something that some might even call promising. Langston Galloway has been the most pleasant of surprises, averaging 12.8 points per game after coming out of literally nowhere compared to most players in this league. He finished with 18 points including 3-of-7 from beyond the arc, and now it’s time to determine whether he’s just another player whose numbers are rising because someone has to fill a vacuum left behind by more talented players, or is he really someone worth counting on for the future. Galloway isn’t the one responsible for the change, which translated into four wins over the last five games, but his enthusiasm and attempt to prove his worth and place in this league has been contagious, with the Knicks playing with a certain amount of effort and enthusiasm we hardly saw from them through most of the first half of the season. Who knows how this will end? A long winning streak is something that can happen and in the East, they might actually end up contending for a playoff spot by mistake. Lance Thomas did a good job against his former teams, as many unused players tend to do after getting rid of with 14 points. Tim Hardaway Jr. might not be improving as he was expected to after a promising rookie season, but he played a big part in the win with his ability to stretch the floor, scoring 14 points on four 3-pointers. He’s averaging 11.4 points per game this season, but he has improved that by almost four points in the recent successful five-game run. Is Galloway another Jeremy Lin? Unlikely. He’s not as impressive as Lin was in 2012, but in New York, a city that keeps drawing attention despite the horrific condition of both its basketball teams, there’s always someone to try and capitalize on the generating hype. Anthony isn’t changing as a player and leader as Derek Fisher suggested. He’s simply healthy enough, and seems to have accepted that this season is something of a standby situation for him, waiting for Phil Jackson to come through on his promises. The Thunder seem to be stuck, with or without Durant playing. The more criticism Westbrook gets for not spreading the ball, the more he shoots. The more criticism Scott Brooks gets for not having an offensive system that’s more than just giving the ball to his two stars and stepping out of the way? The more individualistic their system seems to become. Whatever it is they’re trying to do, their season isn’t picking up to what they want it to be.